But Spring might be here! Yesterday was in the 60s, sunny, clear, and generally beautiful. Today was a few degrees cooler, but overcast and windy -- but still Spring-like! I'm trying not to get too excited! 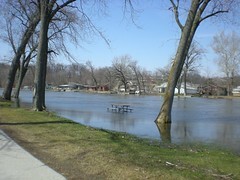 The combination of 60" of snow and a little rain recently means that the rivers are high. 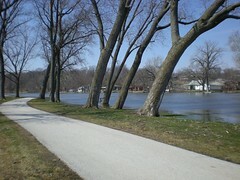 We haven't had flooding in Iowa City, but the Iowa River is definitely higher. The river banks through campus are steep, so it's not so obvious there, but north of campus, where the river runs through City Park, the banks are very shallow. 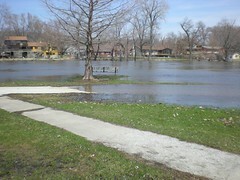 Even in normal circumstances, the river and the banks look "flat," but now, the river is definitely out of its banks. I love that white house across the river. Eek. 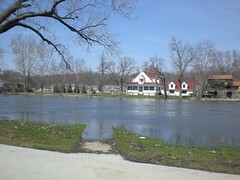 That white house is gorgeous, but no way could you get me to live next to a river. Hey! You survived your first "real" Winter (in a long time)! "S" has not sprung in my hometown-check out the pics I'll be posting in the next day or so Dad took at the cabin (they got 1-2 feet of snow over the weekend). We've got your warm and sunny and breezy anyway. 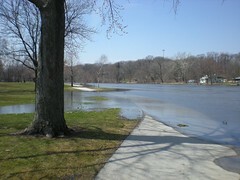 No rivers nearby to overfill their banks though. Personally, I'd rather have the rivers, even if it does mean risking a bit of overflow at times. So pretty! I can't wait to come visit you. And I can't wait 'til you come visit me! I miss naked trees. It's all lush and green in these parts which is also nice, but then again it was 90 degrees yesterday. Enjoy your spring!